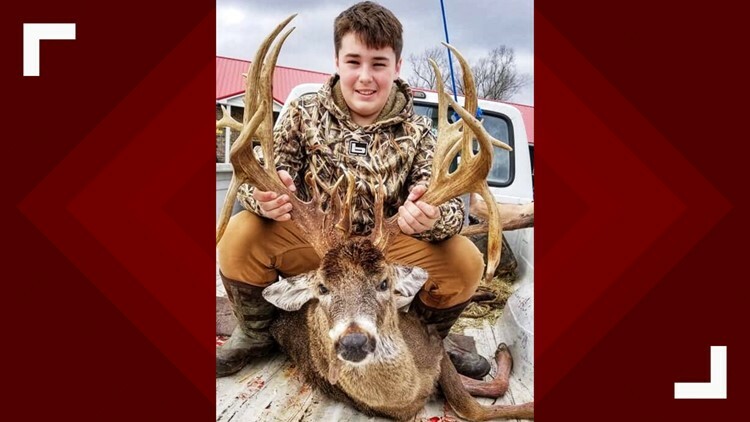 13-year-old Bo Ezell killed a 27-point buck in Benton County, Tennessee. Bo Ezell ended up shooting and hitting the buck three times, later calling it a "crazy" hunt. BENTON COUNTY, Tenn. — A Tennessee teenager thought his hunting was done for the day, only to get a shot at the deer of a lifetime a few hours later. 13-Year-old Bo Ezell killed a 27-point buck in Benton County last Friday, Dec. 28, thanks to some help from a friend. Bo's story has been told all over the internet, including through the Tennessee Wildlife Resources Agency, who congratulated Bo in a Facebook post. Bo woke up one day last week wanting to go squirrel hunting. The only problem was he couldn't find his hunting dog. Just "hanging around the house," Bo got a call from a friend who told him about a buck she saw behind her house. She asked if he wanted to come over and hunt it. The post says Bo went to his friend's home, not expecting to see a giant buck. They walked down to a creek where she spotted it with Bo saying "it looked like it had a big bush on his head." The buck looked directly at Bo, who kept his composure after he initially "started shaking." Bo ended up shooting and hitting the buck three times, later calling it a "crazy" hunt. The agency says the buck has 27 scorable points and the green length score was 213 and seven-eighths inches (the length of the antlers on a buck’s head). It was 6.5 years old.